Hello, today we are going to talk about an all time staple fashion item; the little Chanel Jacket. 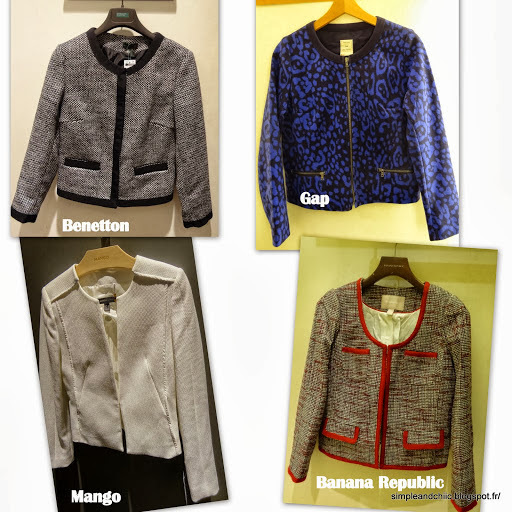 Many “Chanel jackets” can be found in stores this season. Of course when I say Channel jacket I mean inspired by the classic Channel jacket. What s it ? It’s a little square jacket with a round collar and small pockets. Originally the material was in tweed and it was black and It was created by Coco Chanel herself in 1916. From that date to now things have changed as many brands have customized it. The material is not always the tweed and brands play with the size of the pocket or the color. Despite few differences it is always easy to recognize the “Channel style”. I have always loved those jackets because it is so chic but it can also look very old-fashioned if you don’t know how to wear it. Please, please if you do not want to look 10 years older do not pair this jacket with a classic skirt that goes below your knees; that’s the opposite of what you should do. To make the look modern you need to pair this classic jacket with young and modern outfits and accessories. For instance you could pair it with skinny pants and high heels for a young sophisticated look. Or a floating mini skirt and flats for a more casual look. Avoid tight buns and let your hair out or wear a simple ponytail. You need to wear this jacket with hair styles, outfits or accessories that are “young” and “modern”. Now if you want to wear this jacket for work bring it on days your outfit is the most casual. My favorite here is the one from Benetton although it is in black and white (I am a big fan of colors). If I had to wear this for work I would pick riding boots and a floating monochrome bright colored dress (blue, green, purple, pink etc…). The color does not really matter because the black/white color of the jacket fits any monochrome bright color. For an everyday look I would pick bright blue or red skinny pants, a simple white top and high heels . As you can see on the first picture there is a "Chanel jacket" for everyone this season so I hope that you will find yours.